The transformation of this blog is almost finished! Have you checked out the 'About', 'Press' and 'Contact' buttons above?! Feeling nostalgic about baking and this blog, I whipped up a cake that is simplicity at its best, yet anything but ordinary. One of my old-fashioned favorites:; a pound cake. You see many pound cakes here in Holland with 50/50 chocolate and vanilla, so that's what I made. I simply filled the cake tin with vanilla cake batter and poured the chocolate on top. 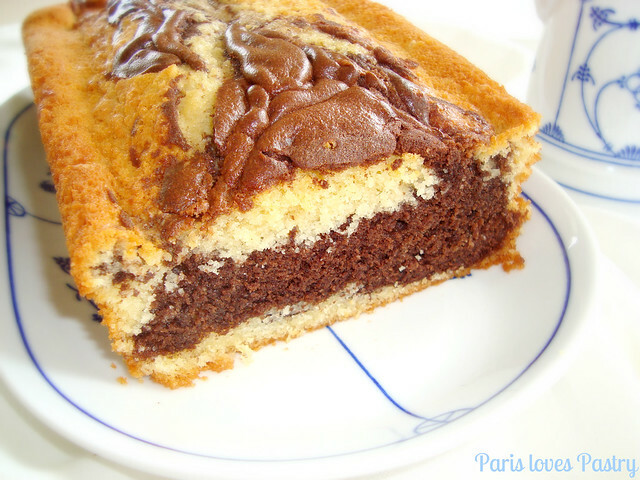 Out the oven came a wonderful, almost-marble effect cake. The taste is sublime! I added a little light brown sugar to the recipe, which gives it just that little extra flavor. J'adore ♥. Rating: 5 out of 5. - Preheat oven to 350 degrees. Generously butter a 9-by-5-inch loaf pan; set aside. - In a large bowl, sift together cake flour, baking powder, and salt; set aside. - In the bowl of an electric mixer fitted with the paddle attachment, cream the butter and the sugars until light and fluffy, about 5 minutes. Add eggs one at a time, mixing to incorporate after each one. Stir in vanilla extract. - Add flour mixture, alternating with buttermilk, starting and ending with flour. Set aside one-third of the batter in another bowl. - In a small bowl, using a rubber spatula, combine cocoa powder and 1/4 cup plus 2 tablespoons boiling water. Mix until smooth. Add cocoa mixture to reserved one-third of batter. Stir until well combined. 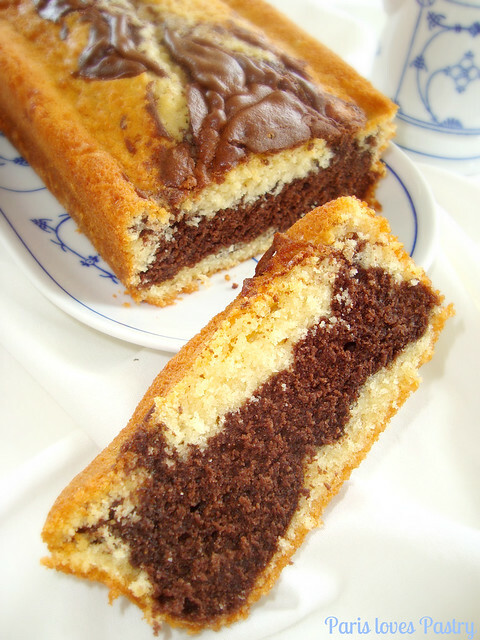 - Fill the prepared pan by alternating large spoonfuls of vanilla and chocolate batters, simulating a checkerboard pattern. Run a wooden skewer or paring knife through batter in a circular motion. - Bake until a cake tester comes out clean, 40 to 50 minutes. Remove to a wire rack to cool; invert after 5 minutes. Cool for about 30 minutes. YUM! I haven't had a good marbled pound cake in such a long time. Whenever my sister and I would bake (gotta love those box mixes) we made the marbled kind always. Luv the changes your are making... the name is perfect!!! Congratulations on the new adventure you are on!! 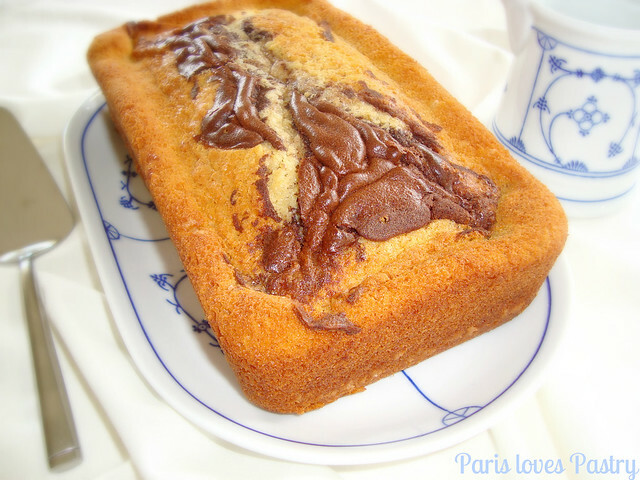 that looks great as I love pound cake! it is not really very sweet and great with fruit as well....another fabulous recipe !! This looks delicious! Perfect for a ladies afternoon or evening gathering. Easy to make and very pretty!